To test the hypothesis that benign prostatic hyperplasia (BPH) robotic surgery with aquablation would have a more pronounced benefit in certain patient subgroups, such as men with more challenging anatomies (e.g. large prostates, large middle lobes) and men with moderate BPH. We conducted prespecified and post hoc exploratory subgroup analyses from a double‐blind, multicentre prospective randomized controlled trial that compared transurethral resection of the prostate (TURP) using either standard electrocautery vs surgery using robotic waterjet (aquablation) to determine whether certain baseline factors predicted more marked responses after aquablation as compared with TURP. The primary efficacy endpoint was reduction in International Prostate Symptom Score (IPSS) at 6 months. The primary safety endpoint was the occurrence of Clavien–Dindo persistent grade 1 or grade ≥2 surgical complications. Fig. 4. 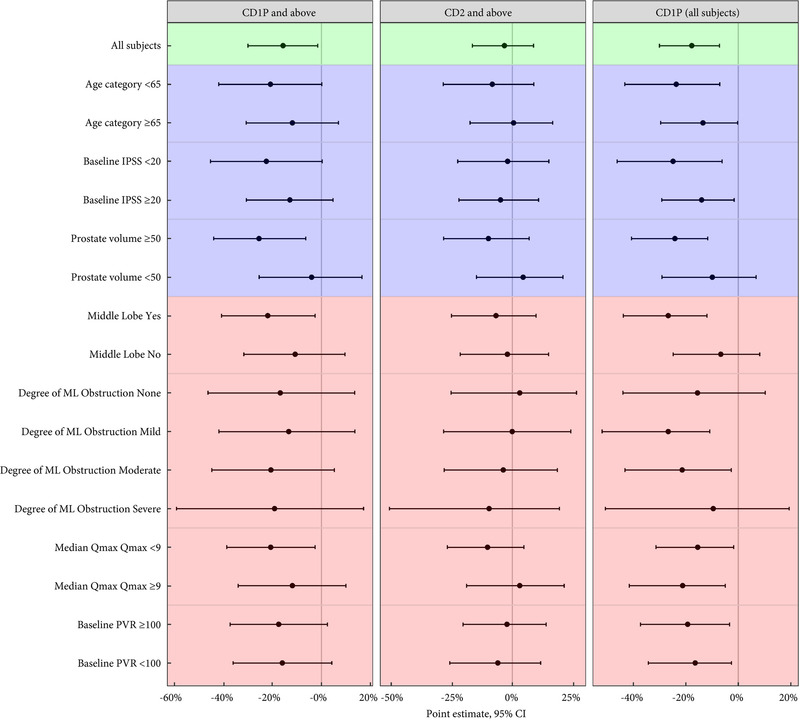 Forest plot of differences in Clavien–Dindo complication rates across treatments by preplanned and exploratory subgroups. CD1P and above refers to persistent CD1 events and CD2–5 events. CD2 and above refers to CD2–5 events. CD1P (all subjects) refers to persistent CD1 events only. Green background = main results; blue = preplanned subgroup analysis; pink = exploratory analyses. For men with larger prostates (50–80 g), the mean IPSS reduction was four points greater after aquablation than after TURP (P = 0.001), a larger difference than the overall result (1.8 points; P = 0.135). Similarly, the primary safety endpoint difference (20% vs 46% [26% difference]; P = 0.008) was greater for men with large prostate compared with the overall result (26% vs 42% [16% difference]; P = 0.015). Postoperative anejaculation was also less common after aquablation compared with TURP in sexually active men with large prostates (2% vs 41%; P < 0.001) vs the overall results (10% vs 36%; P < 0.001). Exploratory analysis showed larger IPSS changes after aquablation in men with enlarged middle lobes, men with severe middle lobe obstruction, men with a low baseline maximum urinary flow rate, and men with elevated (>100) post‐void residual urine volume. In men with moderate‐to‐severe lower urinary tract symptoms attributable to BPH and larger, more complex prostates, aquablation was associated with both superior symptom score improvements and a superior safety profile, with a significantly lower rate of postoperative anejaculation. The standardized, robotically executed, surgical approach with aquablation may overcome the increased outcome variability in more complex anatomy, resulting in superior symptom score reduction.